For the troubling ethical problems with Stand for Children, read our blog post: “Stand for Children is a corporate front group and should stop telling the public how to run public schools“. Here is the thing. 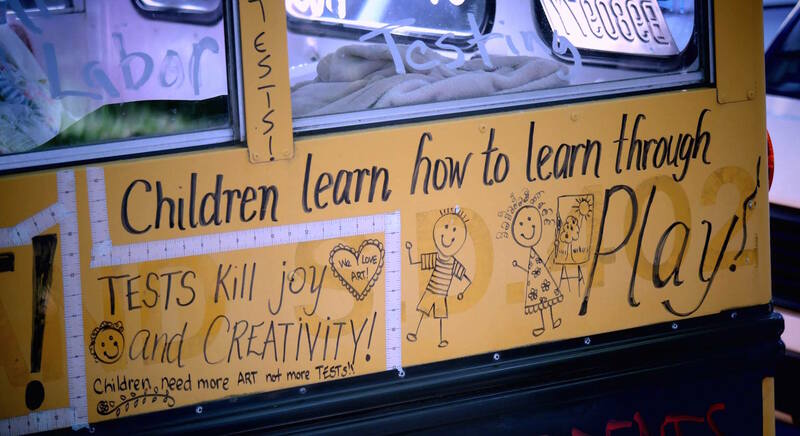 Opting-out of high stakes testing is a protest movement. The Oregon Department of Education refuses to look critically and carefully at the negative impacts of high-stakes testing. Hence, people are protesting in about the only avenue left open to them. Many protests have a large number of white middle-class types. Look at the Vietnam War, the Iraq War, the environmental movement, the abortion issue, gay rights, and on and on. To deride the protests based on the background of people protesting misses the point that it is much harder for some groups of people to spend the time, energy, and money to protest than for others. Many people of color are adamant about opposing high-stakes testing and their negative effects. Go on YouTube and listen to two of the finest African American educators in the country talk about this issue – Brian Jones and Jesse Hagopian. And by the way, Stand for Children’s claim that “Standardized tests are an accountability measure put in place to protect disadvantaged children” is false. High-stakes tests don’t protect anyone. They don’t make schools better. More instruction time gets lost to preparing for tests. High-stakes tests label schools, kids, and teachers in a negative way, while making it much tougher for “disadvantaged” children to get a good education. And we spend millions to get results that aren’t used to help one school, one kid, or one teacher. We need to know how our schools and kids are doing, but in a way which helps our schools do better, not in a way which makes it more difficult for kids to learn. High-stakes testing, including the poorly constructed SBAC test, doesn’t do that. The faster corporate front group Stand for Children and Arne Duncan figure this out, the better off we will all be. From our July 2015 monthly newsletter, out soon. Subscribe at this link! These high stakes tests are not benefiting, but discriminating against minorities and special needs students and all students for that matter. Just by the nature of the tests relying heavily on reading comprehension for math and the use of passages and texts 2 and 3 years above grade level. Who are these people kidding?